So here’s the deal – back in July 2005 Chris Bray (then 22 and Australian Geographic’s Young Adventurer of the Year) and Clark Carter (then 21), plunged deep inside the Arctic Circle to do what no one ever had – travel unsupported across Victoria Island, the world’s ninth largest and largely unexplored island. Their route - from the most Easterly tip of the to the most Westerly – would take them past approximately 1,000km of incredibly varied terrain – everything from mud, rock and grass to frozen coastlines, high plateaus, lake-strewn marshlands and even sheets of ice and snow. 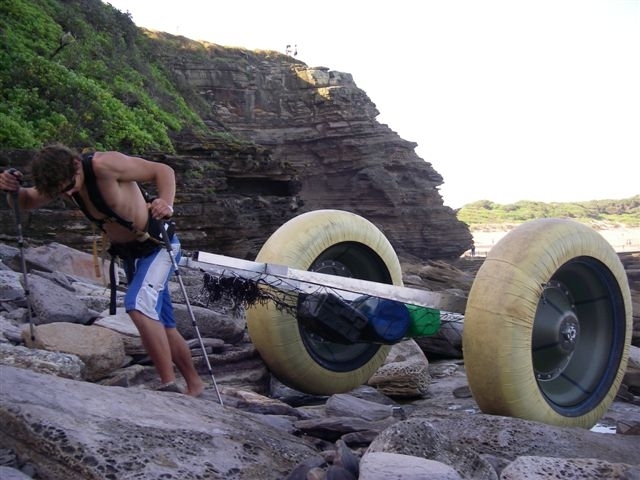 As nobody had ever done such a thing in that area, Chris and Clark had an interesting time devising a suitable cart/kayak that would not only get them across the countless lakes and rivers as well as over the tundra, but was also capable of supporting 200kg of gear each. So together they set to work designing and building two PAC’s (Paddleable Amphibious Carts), which were essentially fancy aluminium kayaks with fold-down wheels. 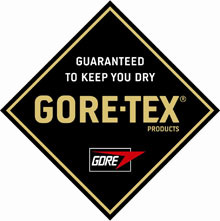 Sponsored by leading organisations including Australian Geographic, Gore-Tex, Air Canada Leatherman and more, their adventure received large amounts of media coverage including weekly live TV news interviews via satellite, broadcast internationally. The expedition was heralded as a great success, despite the fact that after 58 days alone, Chris and Clark were not on the other side of Victoria Island, but were only around one third the distance across! They had such an incredible time though – including being chased by arctic wolves, hiding from polar bears, enduring blizzards and witnessing some amazing unseen landscapes - that they vowed to return to continue their journey to traverse Victoria Island. For two years they thought about how best to re-tackle the problem, what they should do differently and how to make it even more exciting. Chris finished his Engineering degree at uni while Clark chewed through more of his film and media studies, and at last they pulled together their plan for The iiNet 1000 Hour Day Expedition! 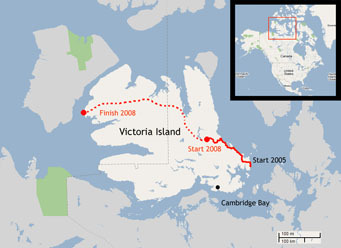 The plan is that in May 2008, Chris and Clark will be dropped off at the finishing point from the 2005 expedition, dig up an Australian Geographic Society flag they conveniently left buried there, and continue on, carrying it to the most Westerly point of Victoria Island, still a good 700km away. This time though, the boys have the advantage of experience and hindsight and have totally re-designed their PAC to be lighter, stronger, weirder and, importantly, easier to handle over the rough terrain. 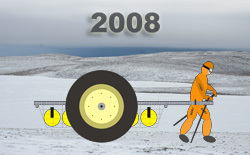 Huge tractor inner tube tyres covered with bullet-proof Kevlar fabric should help prevent them sink into mud pits, break through thin ice, and let them roll easily over larger obstacles. See the PAC section below for more details. They have also learnt never to underestimate how long such a trip will take and will bring 100 days of supplies with them for the continuation of their world-first adventure. Once on the far West side, the pair will be picked up and flown back to civilisation where at once they will enjoy all sorts of un-rationed food and showers. In 2005 we designed and built two aluminium kayaks with fold down wheels, which we called our PAC’s (Paddleable Amphibious Carts). 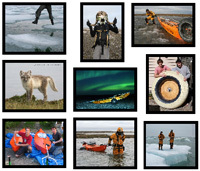 These were strong enough to carry 250kg of supplies over tundra, mud, water and ice. When we reached water, we simply folded the wheels up, got inside and started paddling. We learnt a lot during the 2005 expedition, including what works and what doesn’t, which is why we have totally re-designed our PAC’s to be lighter, stronger and generally completely different this time! The new PAC includes huge 1.5m diameter wheels which are actually tractor inner tubes we have covered in puncture-proof Kevlar fabric. 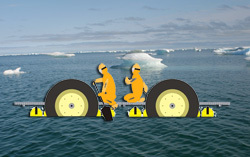 We hope this will allow easier rolling over all sorts of nasty bumps and rocks, as well as roll over mud, slop and thin ice without sinking in too far. They also float, so when we get to water, we simply join the two PAC’s together end to end, wheel them in and paddle it like a raft. No more wasting time looking for tent sites or sleeping on ice, mud or sharp rocks: Each night we will simply snap the 2 PAC’s together end-to-end and prop up the two single-man tents which always stay ready on top of the PAC’s - with sleeping bags etc already inside – just slide the poles in and we’re all set. The tents are linked with a specially designed connecting vestibule. We are currently building our prototype PAC for the 2008 expedition - sewing up our bullet-proof Kevlar covers, machining up the axles, moulding the rims, and testing out various concepts and ideas. We hope to have a working prototype finished and ready to test by the end of 2007 - we'll keep you posted on our progress in the news section. So far so good!